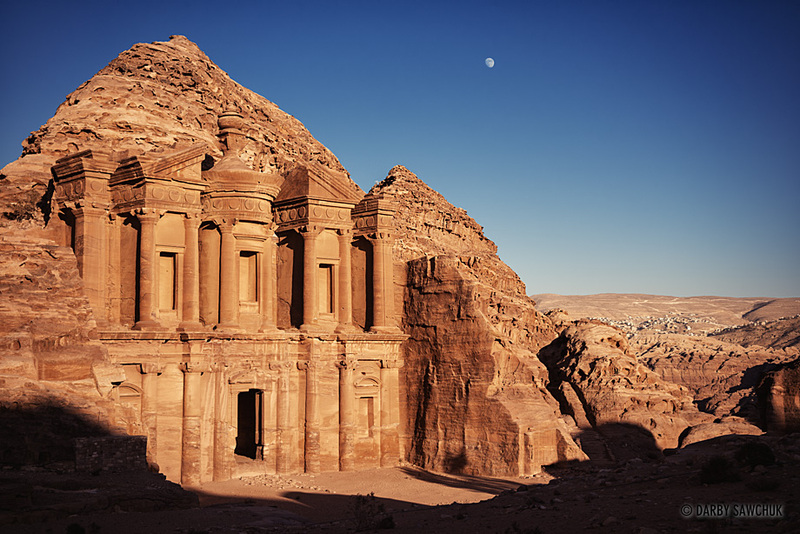 An oasis of calm in an otherwise turbulent region, Jordan welcomes visitors to a land full of millennia of history, otherworldly landscapes, and cultural delights. 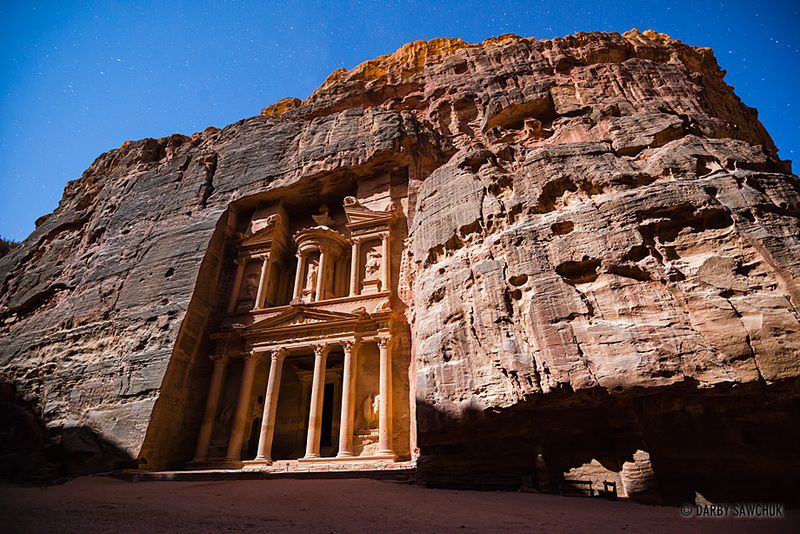 Many come for that startling moment of wandering through Petra’s Siq to glimpse that first view of the Treasury, but just as with the rest of Petra, Jordan has more surprises in store. There are the Eastern Desert Castles sprouting from the desolate landscape. 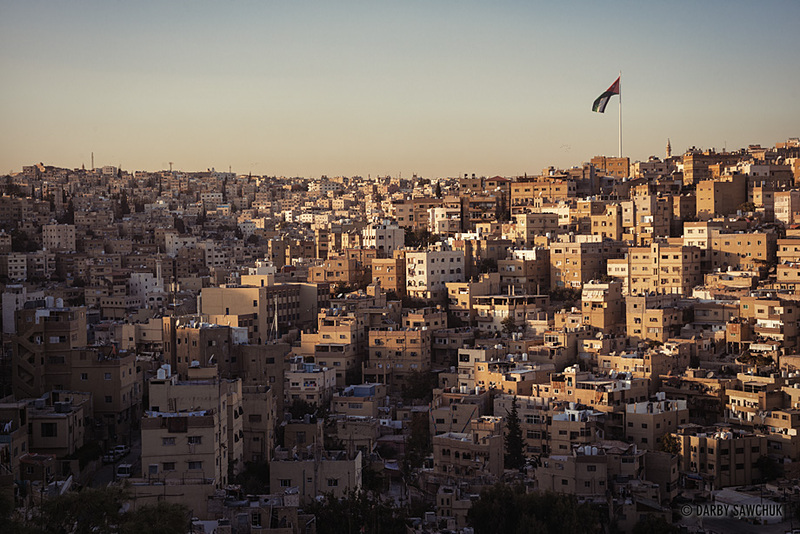 The haunting chorus of call to prayer echoing through Amman’s hills. The ancient mosaics sometimes so abundant you have to watch where you stand. The Roman ruins as well preserved as anything in Italy. The impossible buoyancy in the Dead Sea. The food that sometimes seems so simple you wonder how it can be so delicious. 01. 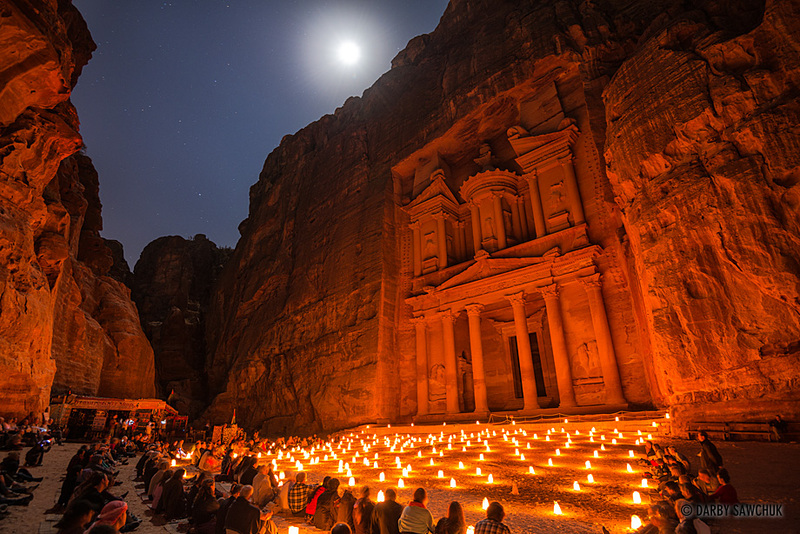 Candles and moonlight illuminate Al-Khazneh, the iconic Treasury of Petra, Jordan. 02. 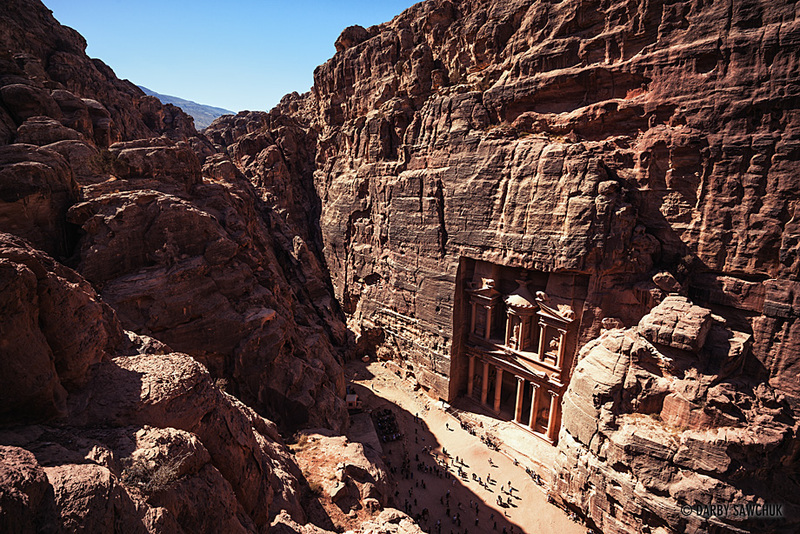 The path above the royal tombs gives a bird’s eye view of the Treasury in Petra, Jordan. 03. 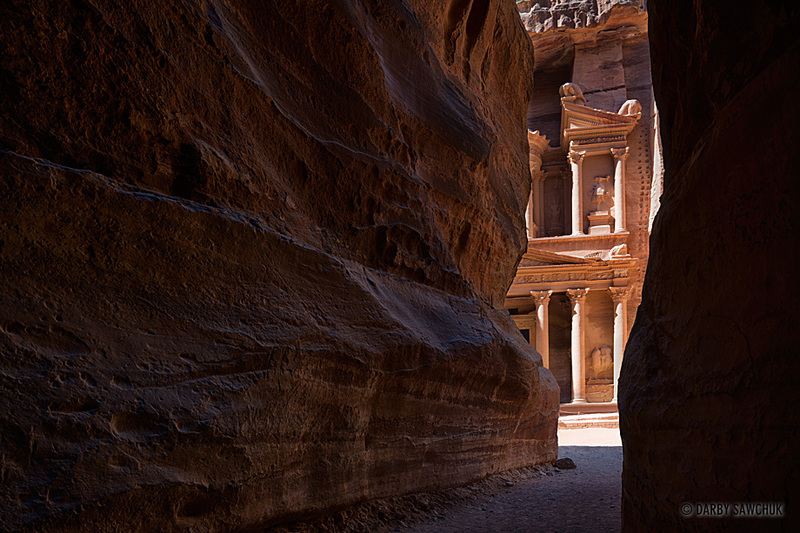 The narrow canyon walls of the Siq open up to reveal the Hellenistic facade of the Treasury. 05. 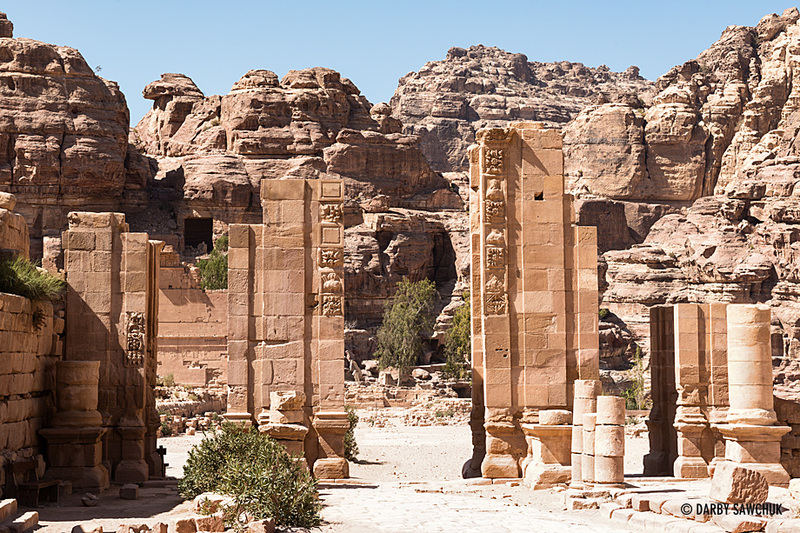 The Temenos Gateway, a nearly 2000-year-old ruin that once marked the entrance to Petra city centre’s sacred courtyard. 06. 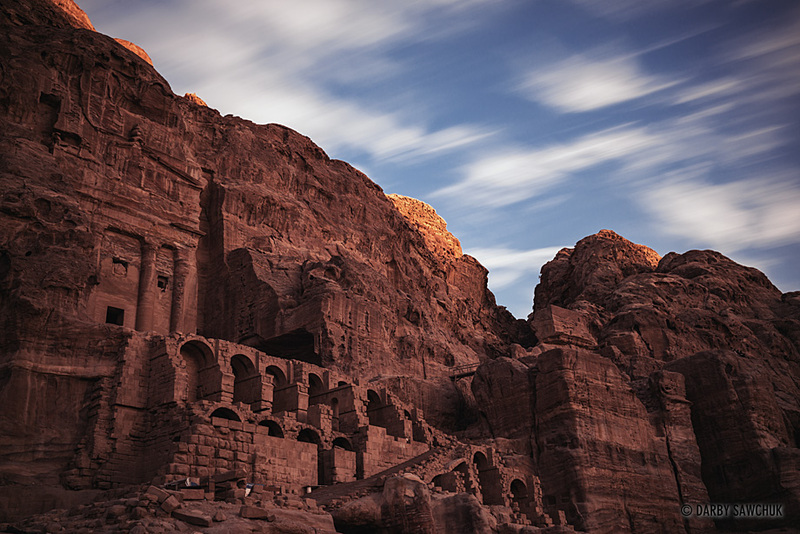 Late afternoon sun colours the sandstone of Al-Deir, the Monastery of Petra. 07. 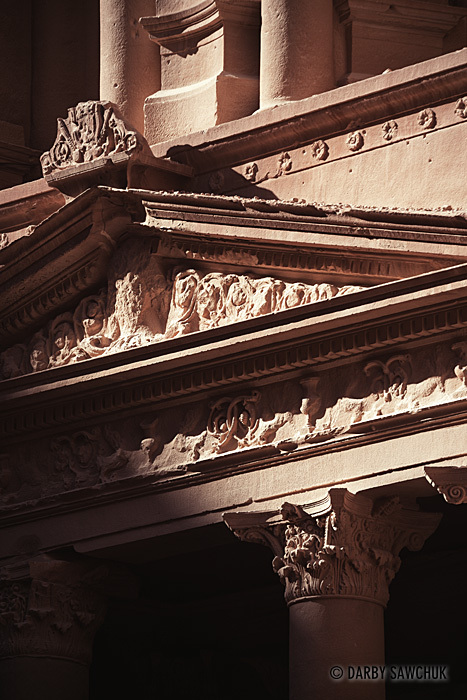 A detail view of the morning light striking the pediment of the Treasury in Petra, Jordan. 08. 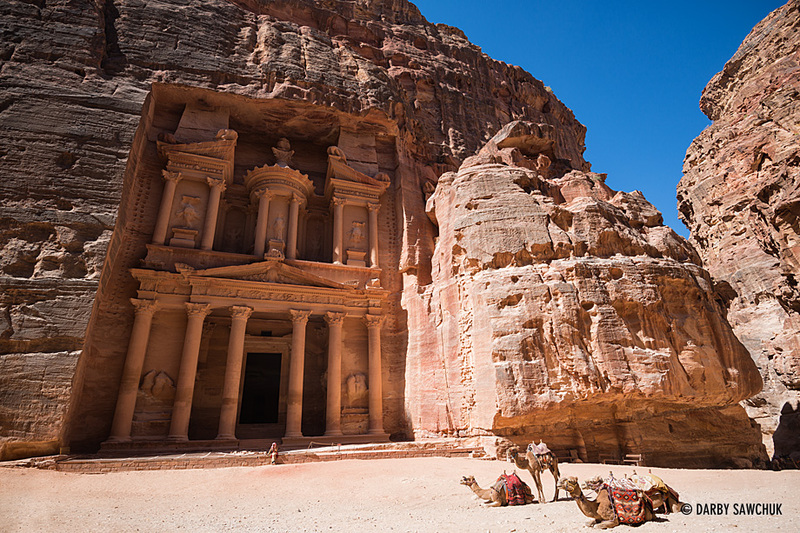 Camels rest in the sheltered canyon in front of the Treasury in Petra, Jordan. 09. 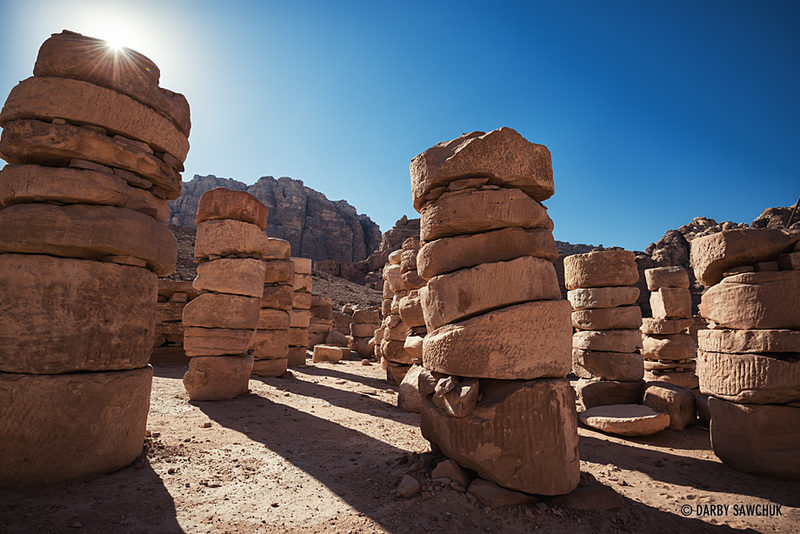 Stacked sandstone columns among the ruins near the great temple at Petra. 10. 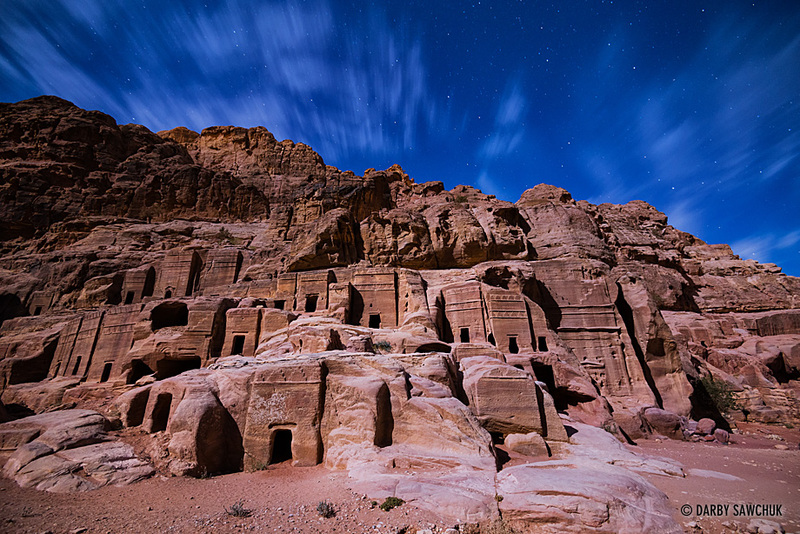 Stars are visible as Petra’s Treasury is lit by moonlight. 11. 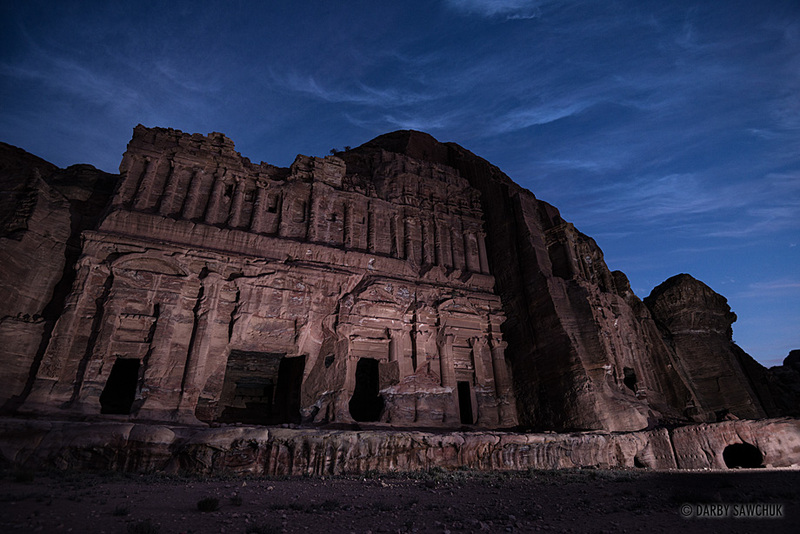 Evening at the Corinthian Tomb, one of the Royal Tombs of Petra. 12. 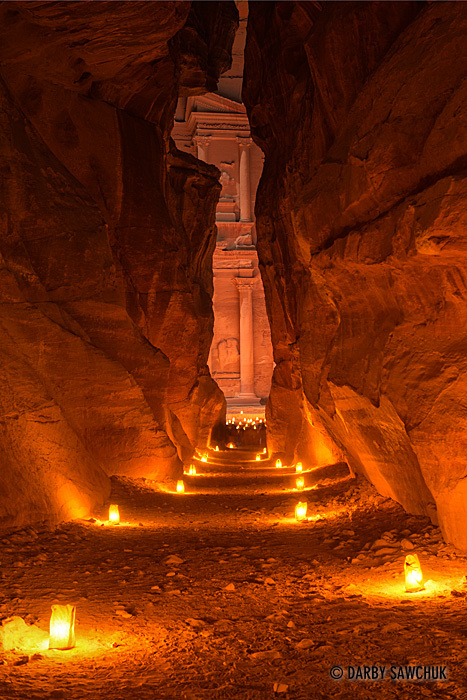 Candles light the narrow canyon walls of the Siq as well as the facade of the Treasury at its end. 14. 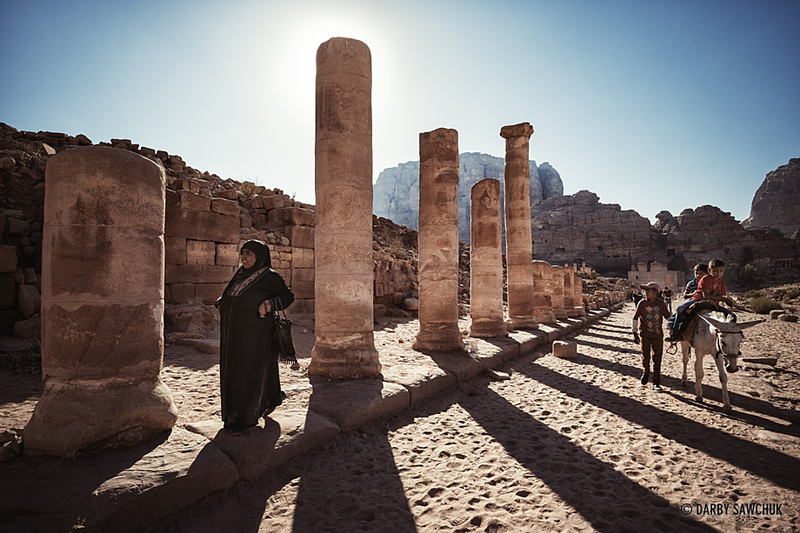 Late afternoon sun casts long shadows on people walking along Petra’s Colonnaded Street. 15. Clouds streak past the Urn Tomb as the last light of day retreats from the surrounding hills. 17. 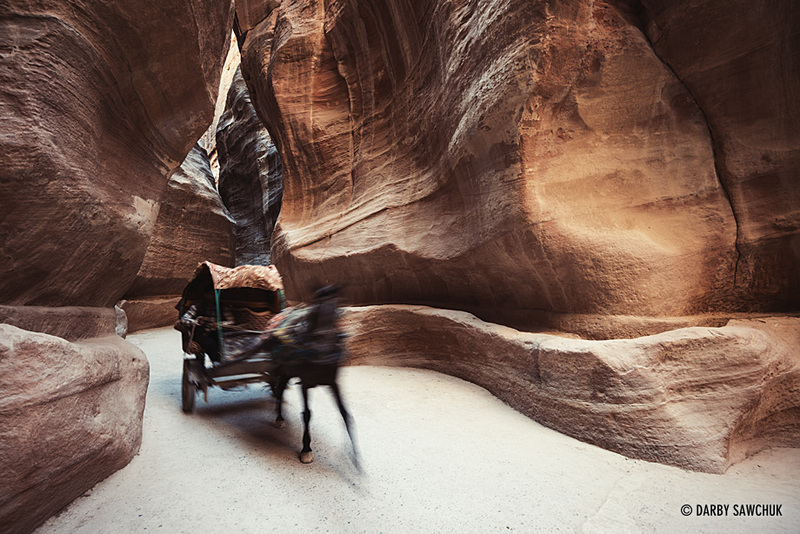 A horse and carriage move through the narrow, flowing canyon of the Siq in Petra, Jordan. 19. The Street of Facades illuminated by moonlight with stars above. 20. 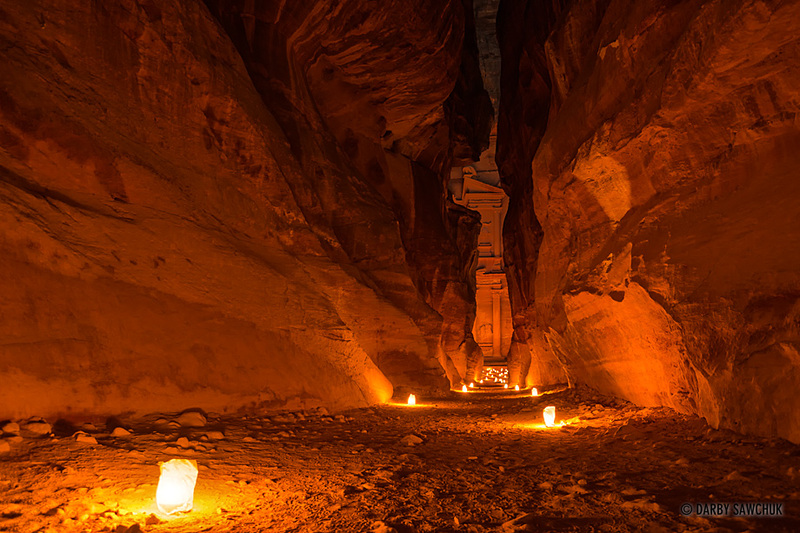 Candles light the narrow canyon walls of the Siq as well as the facade of the Treasury at its end. 22. 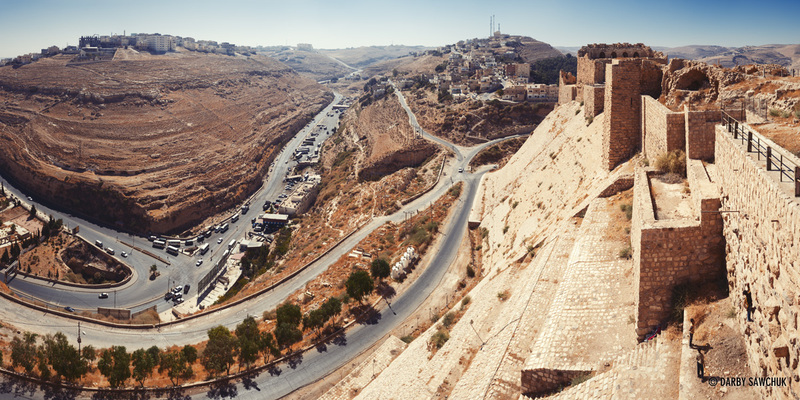 The crowded hills of Amman, Jordan’s capital, overlook busy roads beneath. 23. 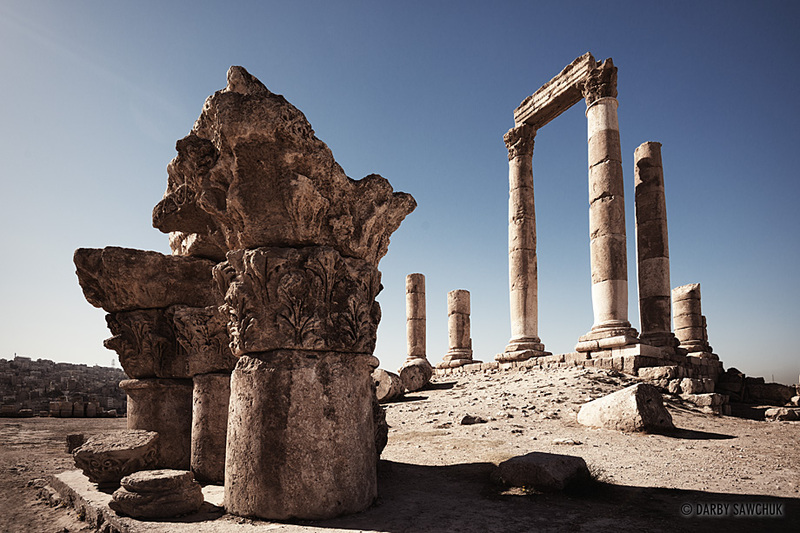 The Roman ruins of the Temple of Hercules stand atop Amman’s tallest hill surrounded by the Citadel. 24. 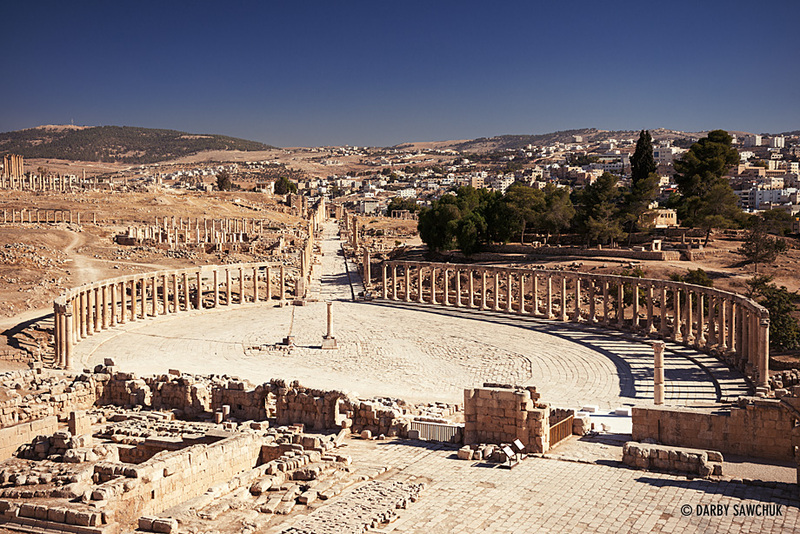 The Roman Theatre, an impressive amphitheatre cut into a hillside in Amman, Jordan. 25. 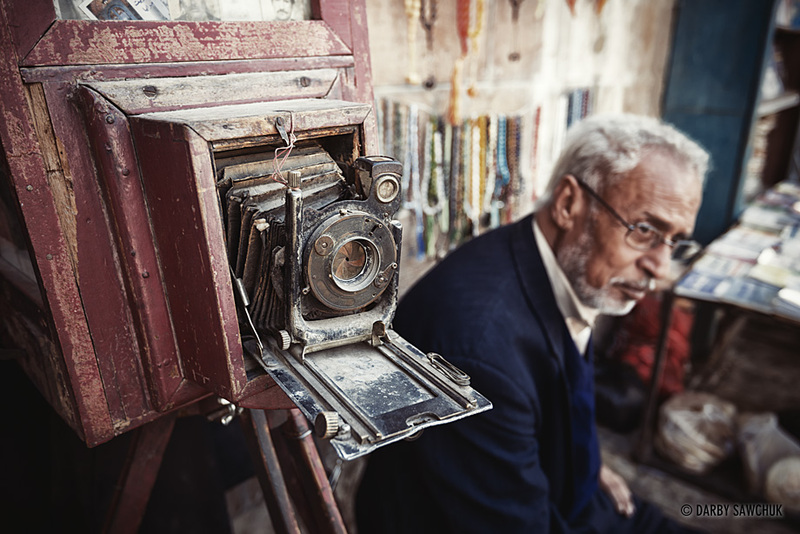 A vendor sits with a vintage camera at an open air market in Amman, Jordan. 26. 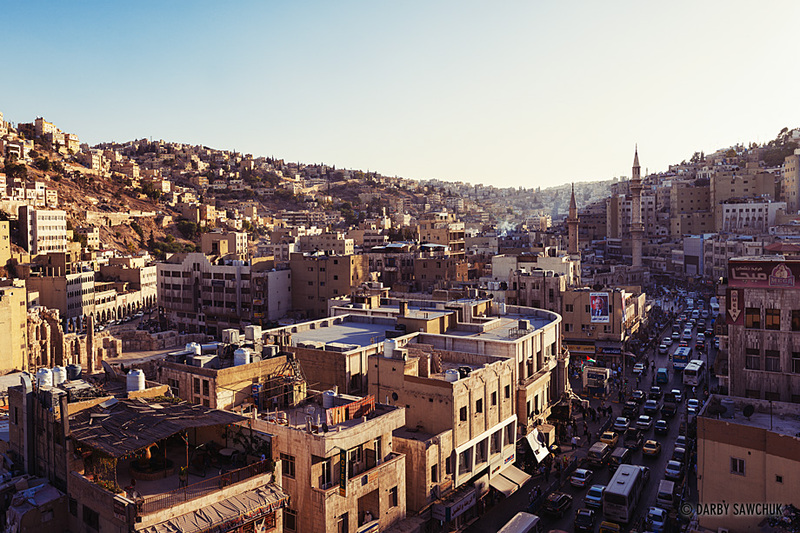 Buildings crowd the hillsides of Amman, Jordan. 27. 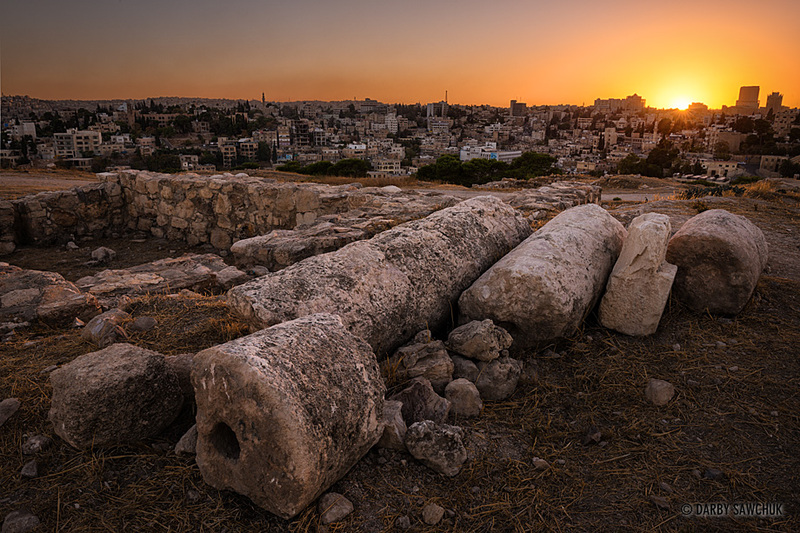 Sunset light bathes ruined Roman columns at the Citadel atop Amman, Jordan. 28. 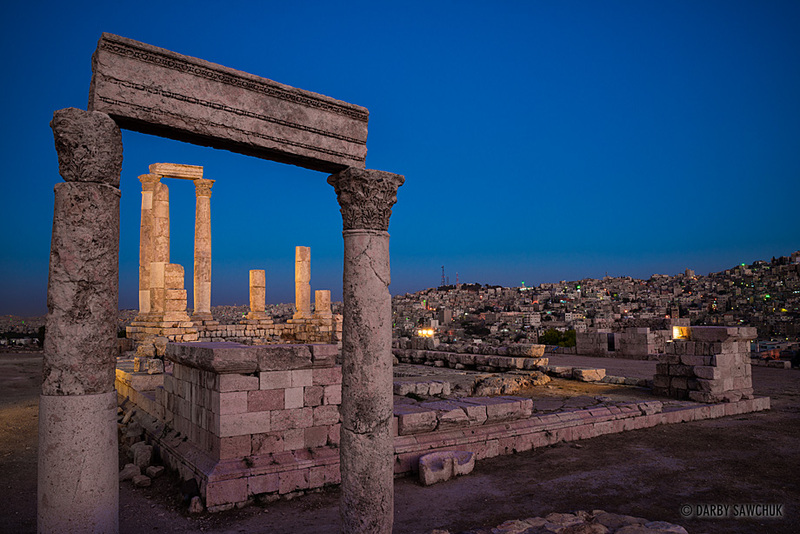 The Temple of Hercules at dusk in the Citadel atop Amman, Jordan. 29. 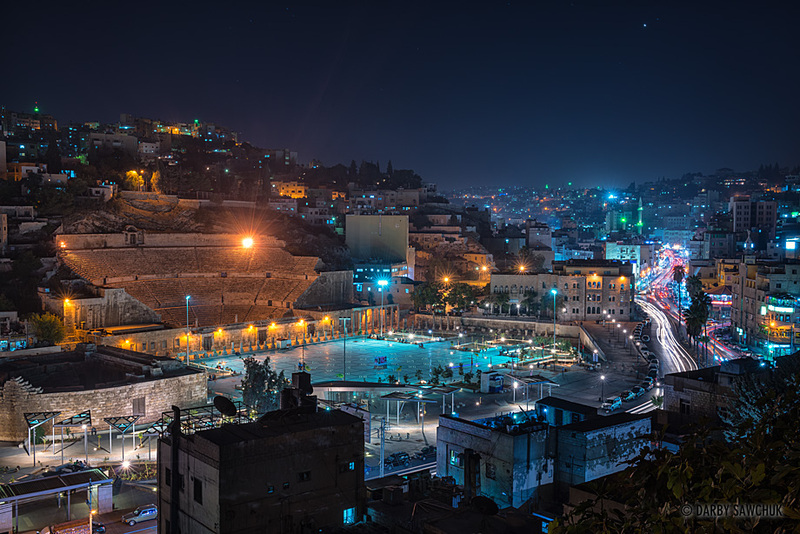 The Roman Theatre and the busy traffic of Amman’s surrounding hills at dusk. 30. 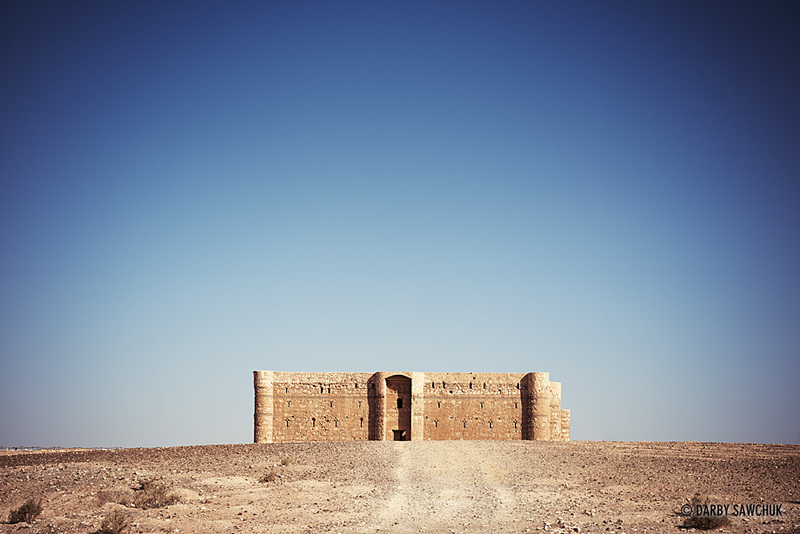 The 8th-century Qasr Kharana, one of Jordan’s Eastern desert castles, may have been a caravanserai in its isolated location. 31. 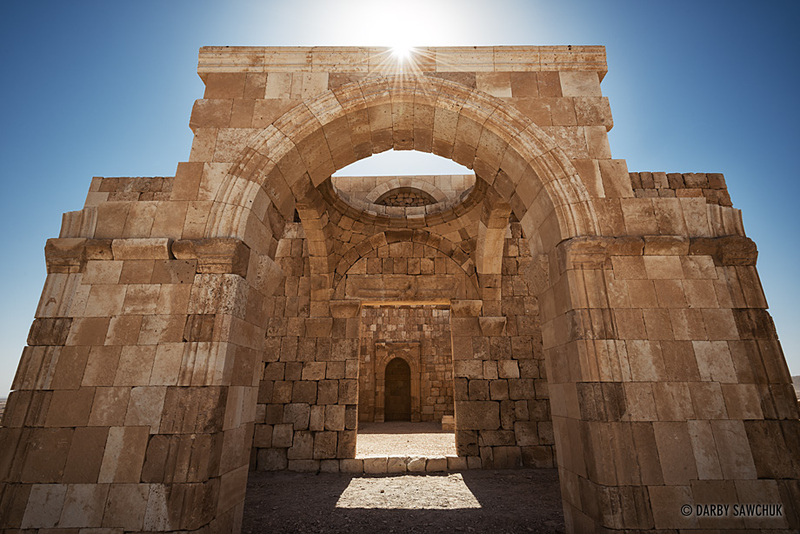 The complex of Qasr al-Hallabat, originally a Roman fortress in the eastern desert of Jordan. 32. 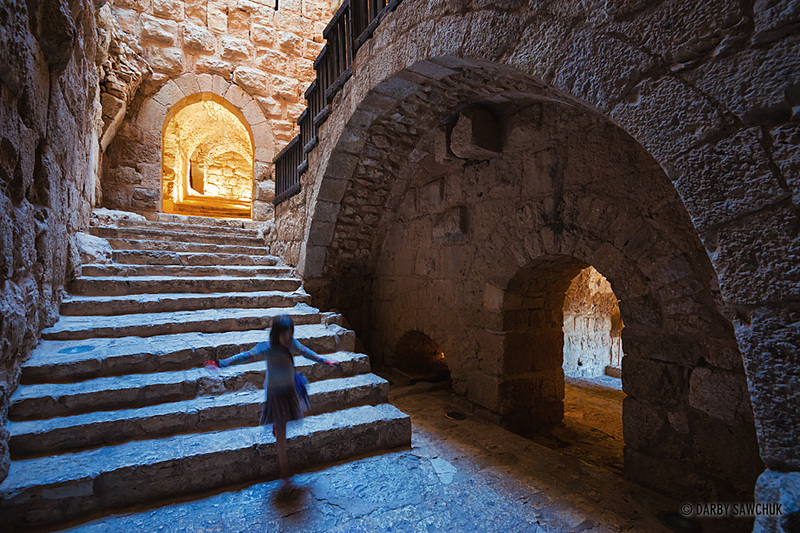 A girl dances down the steps of Qa’lat ar-Rabad, also known as Aljoun Castle. 33. 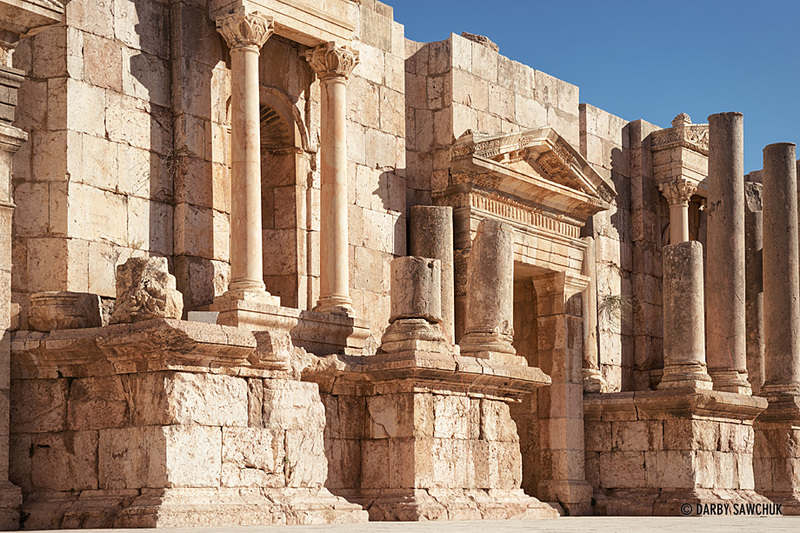 Columns surround the Oval Forum of the well-preserved Roman city of Jerash. 34. 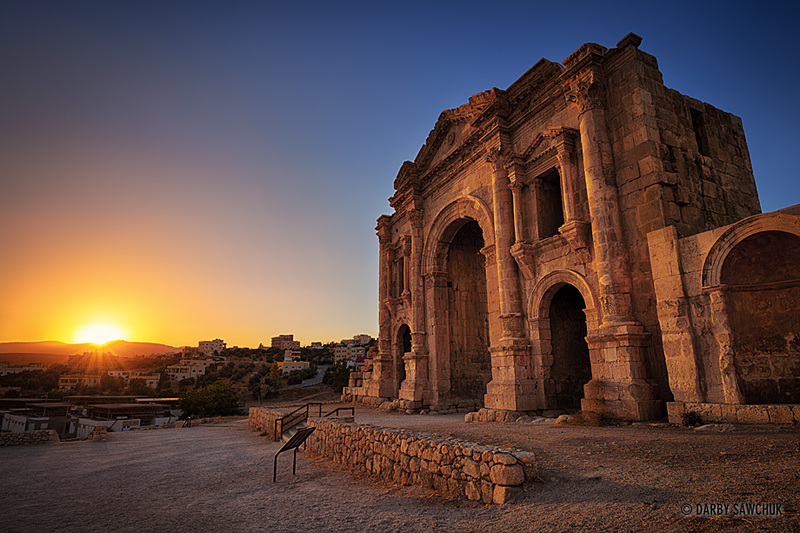 Hadrian’s Arch, the entrance to the Roman city of Jerash, glows in the sunset light. 35. 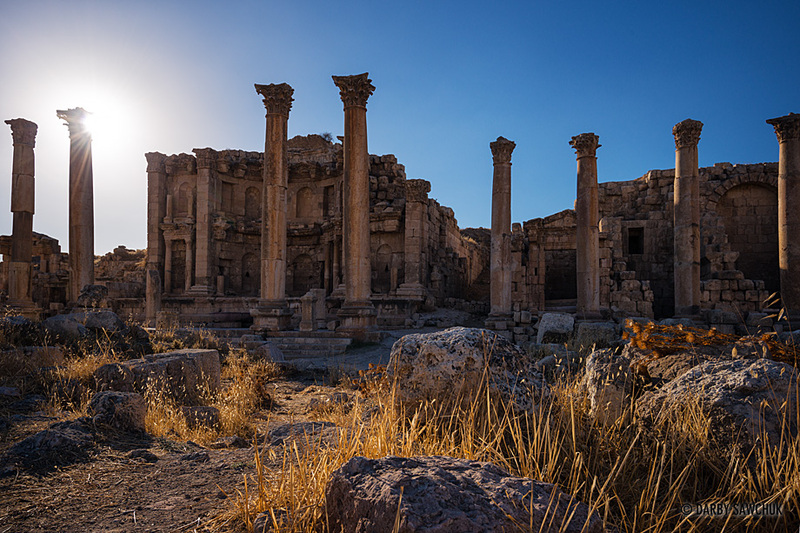 The colonnaded cardo maximus fronts the Nymphaeum, formerly an ornamental fountain in the Roman ruins of Jerash. 36. 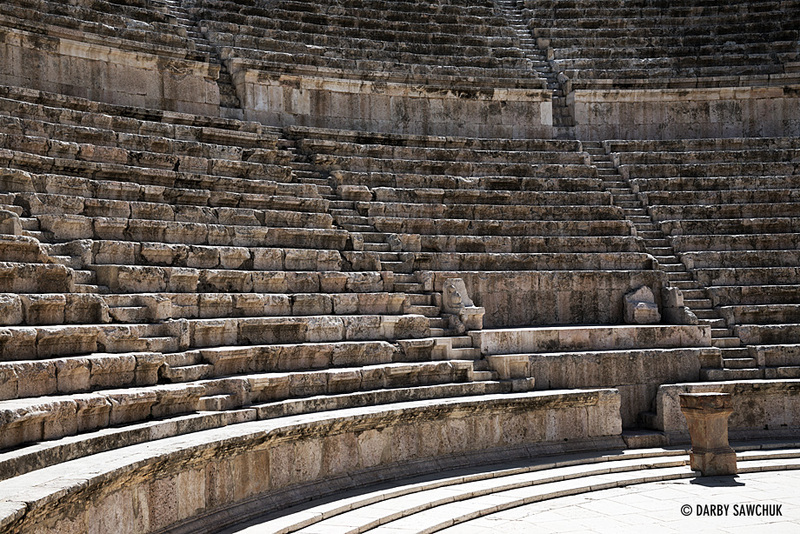 The elaborate stage backgrop of the South Theatre in the Roman city of Jerash. 37. 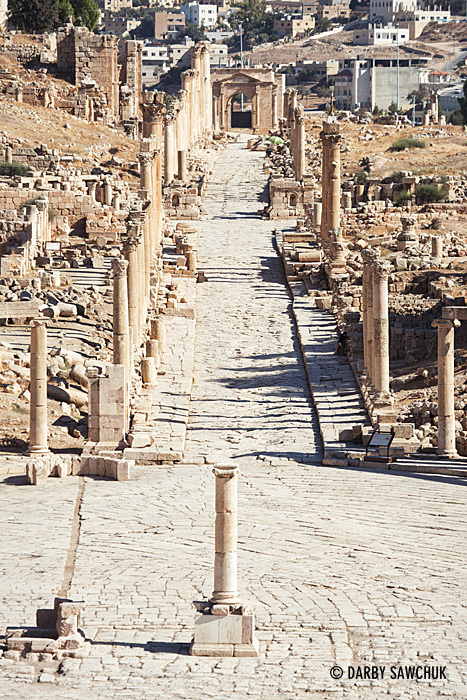 Columns flank the long, straight cardo maximus leading to the Oval Forum in Jerash, Jordan. 38. 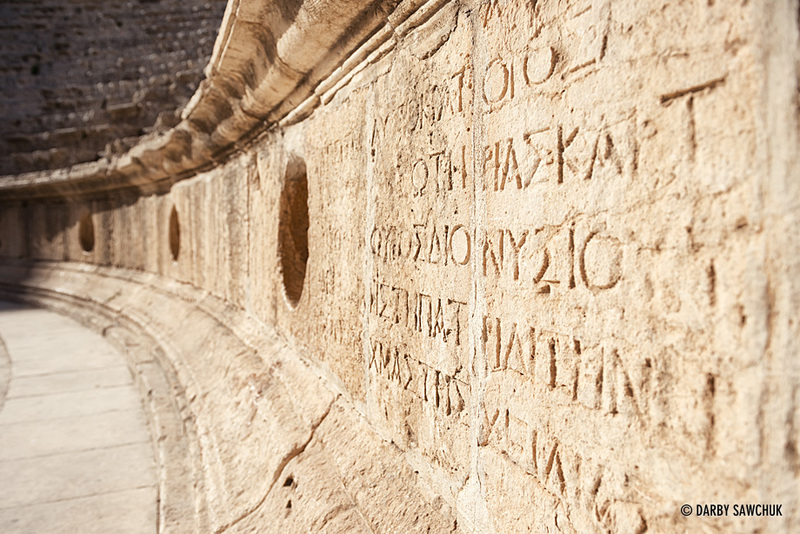 Greek inscriptions decorate the stone in the South Theatre in Jerash, Jordan. 39. 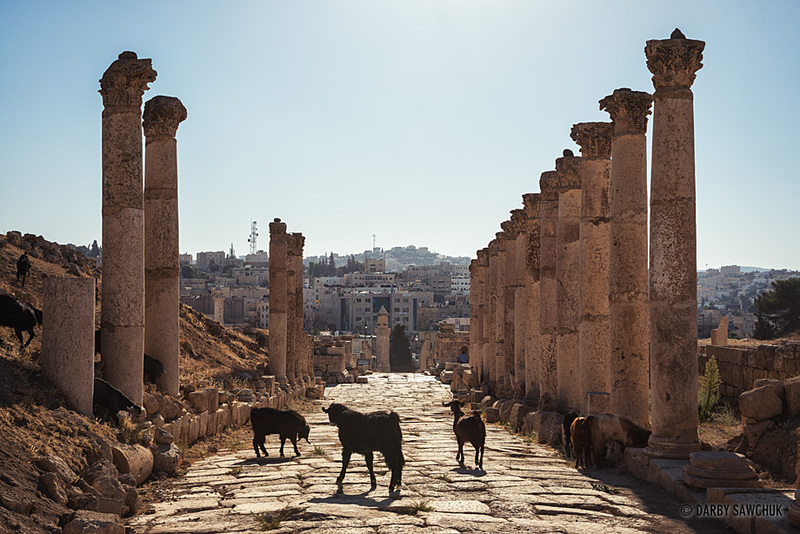 Goats wander along the South Decumanus, a colonnaded street in the ruined Roman city of Jerash. 40. 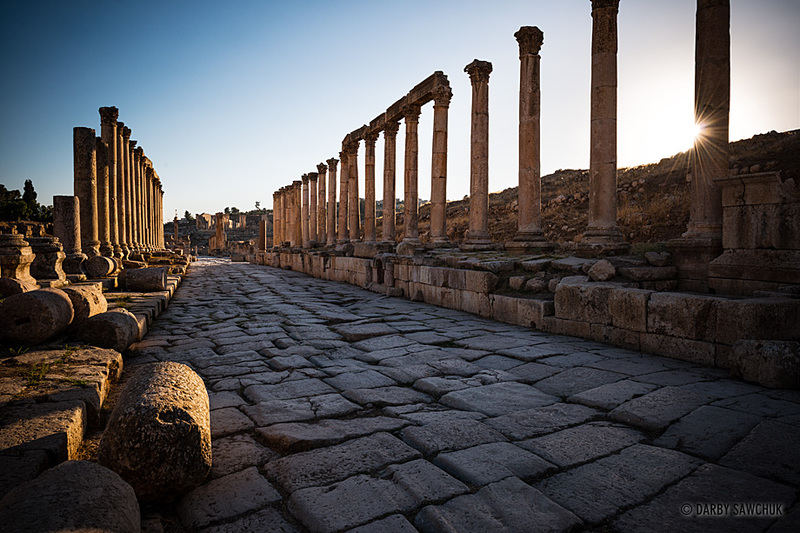 The cardo maximus stretching from the Oval Plaza to the North Gate in Jerash, Jordan. 41. 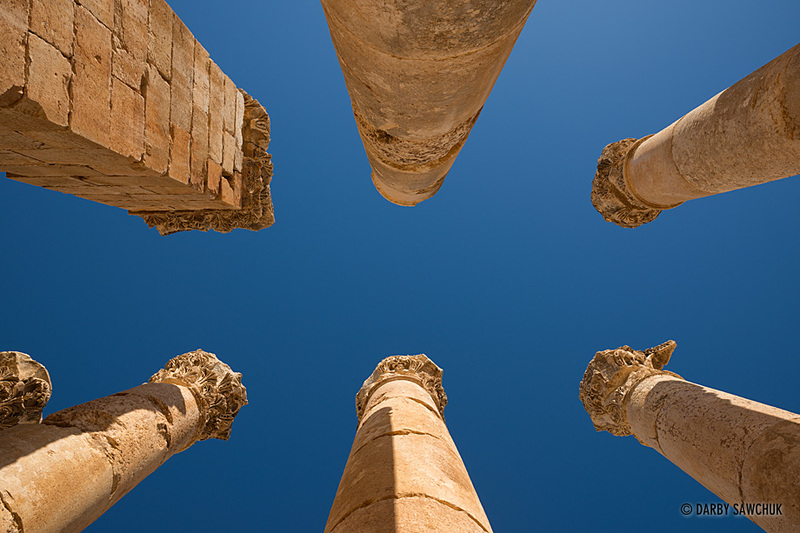 The sandstone columns of the Temple of Artemis rise towards the sky in Jerash, Jordan. 42. 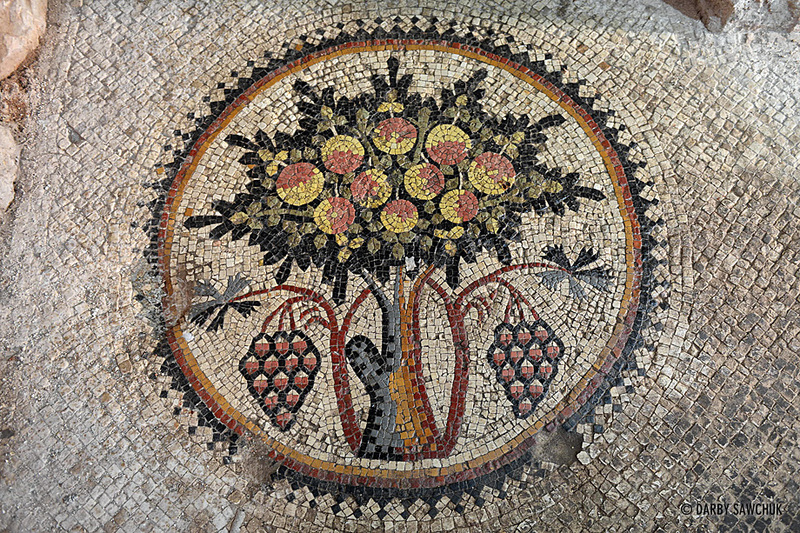 The tree of life, one of the many famous mosaics in Madaba, Jordan. 43. 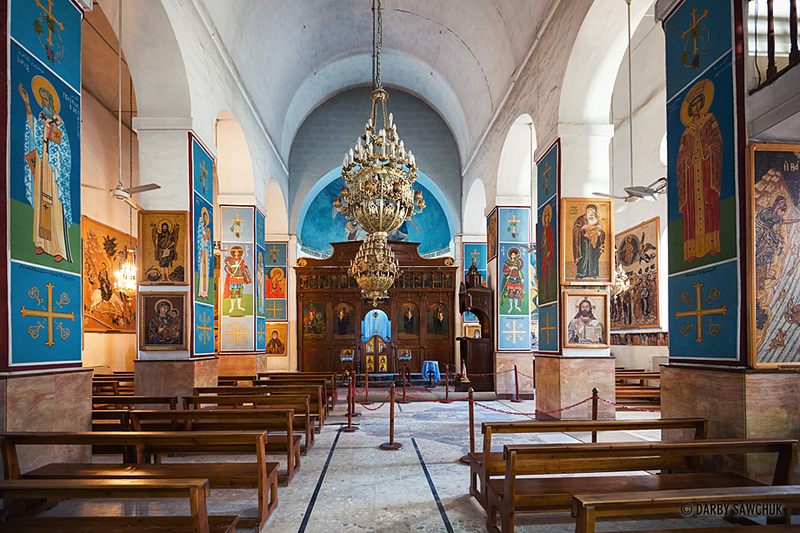 The Greek Orthodox St. George’s Church in Madaba which features the Mosaic Map, the oldest known map of Palestine. 44. 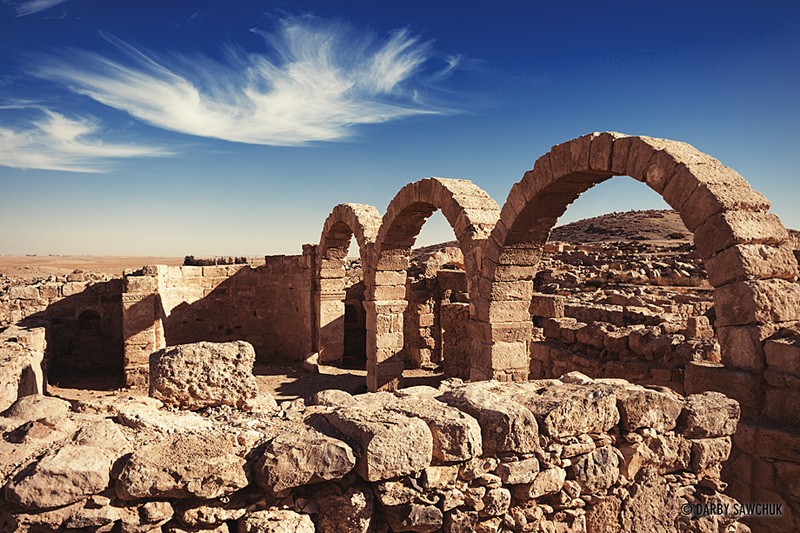 Arches of ruined Roman buildiongs at the UNESCO World Heritage Site of Umm ar-Rasas. 45. 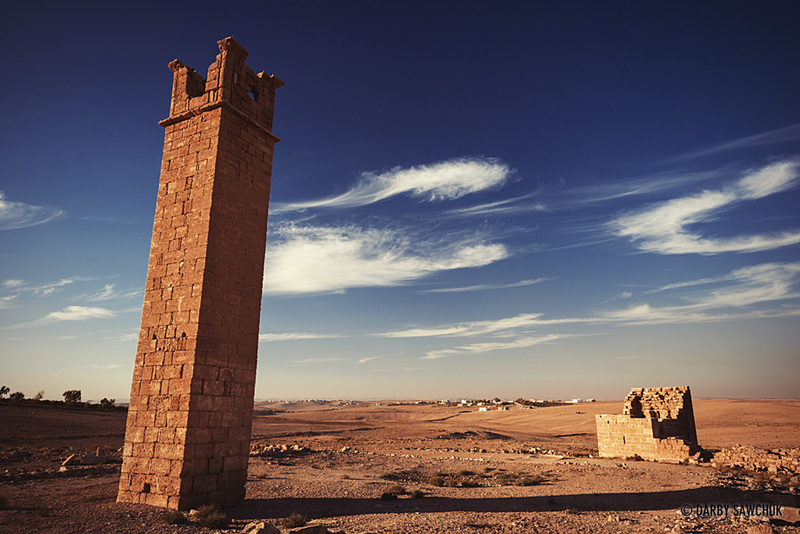 The enigmatic, stairless stone tower just north of Umm ar-Rasas in Jordan. 46. 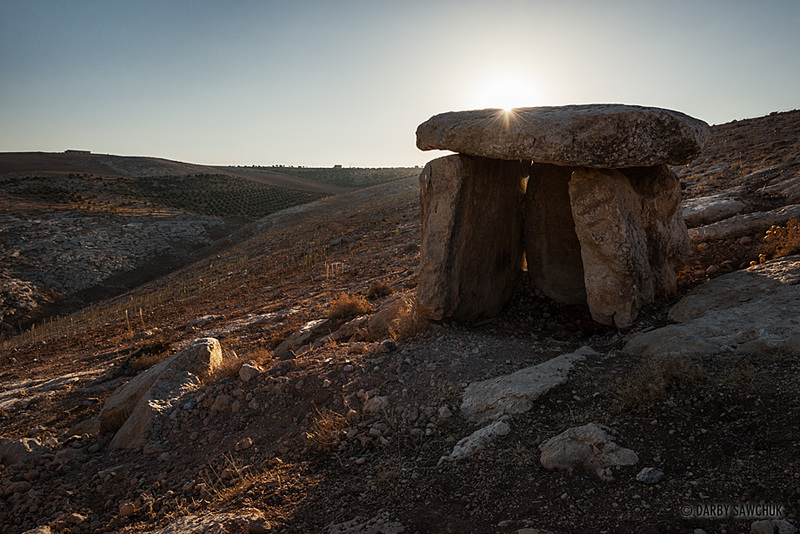 One of the ancient stone dolmens of Wadi-Jadid near Madaba in Jordan. 48. The walls of Karak castle high atop the hills overlooking Karak, Jordan. 49. 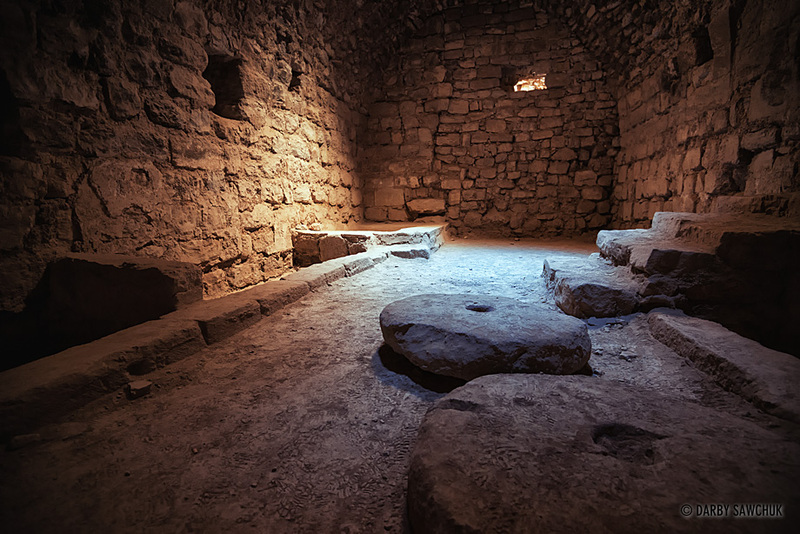 One of the dark interior chambers of the crusader castle at Karak, Jordan. 50. 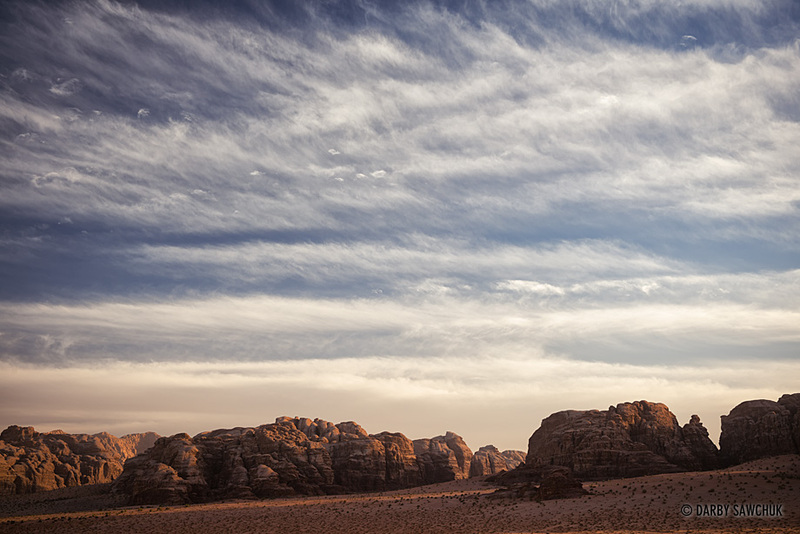 A Bedouin man gazes across the sands of Wadi Rum towards one of the desert’s otherworldly jebels. 51. 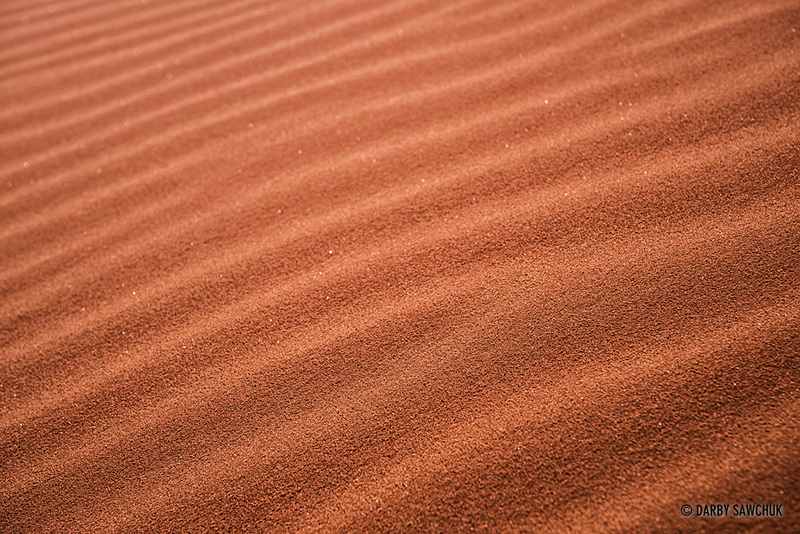 Ripples in the sand of Umm Ishrin, a red sand dune in Wadi Rum, Jordan. 53. 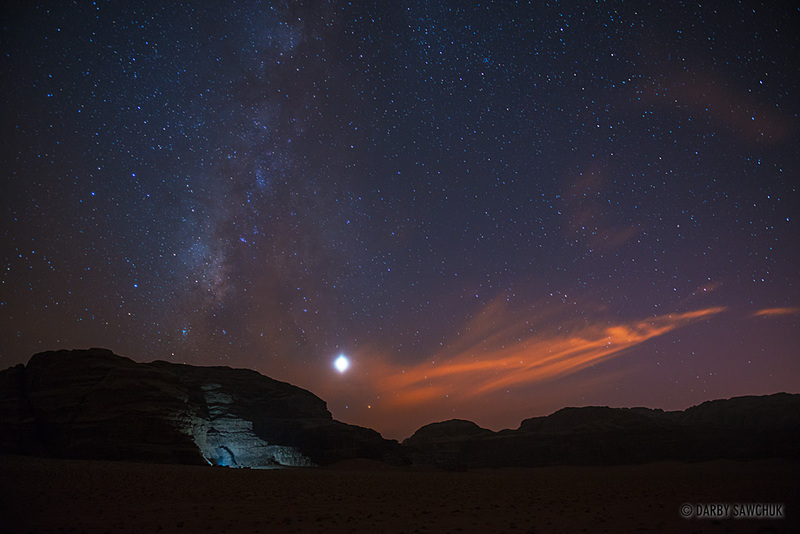 The milky way and Venus shine over an illuminated campground in the shadow of Wadi Rum’s jebels. 54. 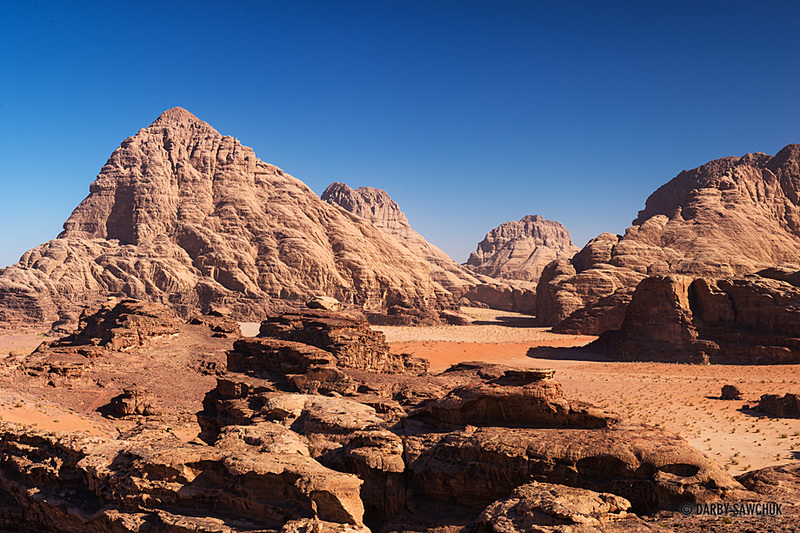 The martian landscape of the rock formations in Wadi Rum, Jordan. 56. 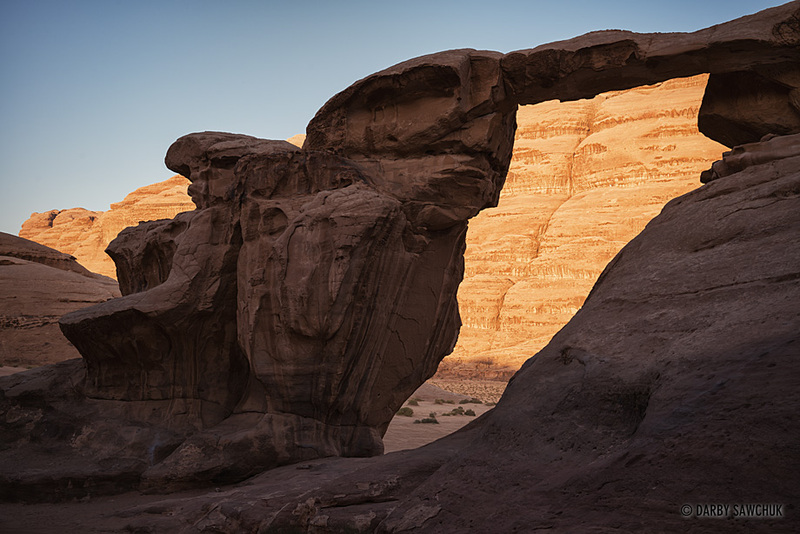 The Umm Fruth rock bridge in Wadi Rum, Jordan. 57. 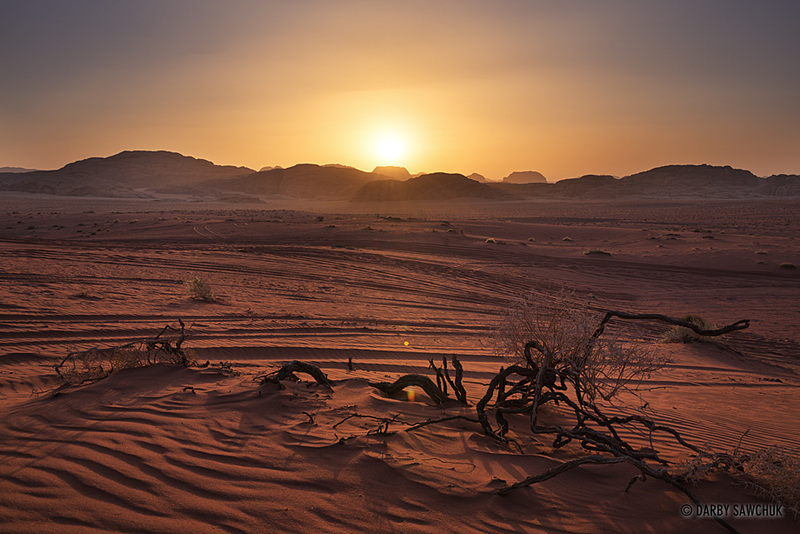 Sunset over the dunes and jebels of Wadi Rum. 58. 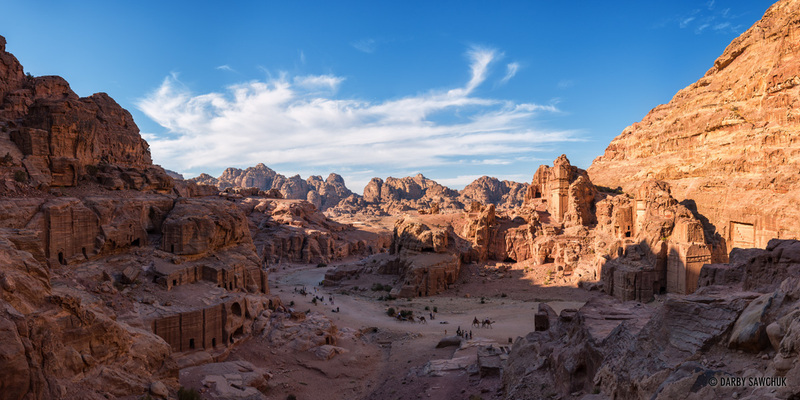 The view from Lawrence Spring across the desert sands of Wadi Rum, Jordan. 59. 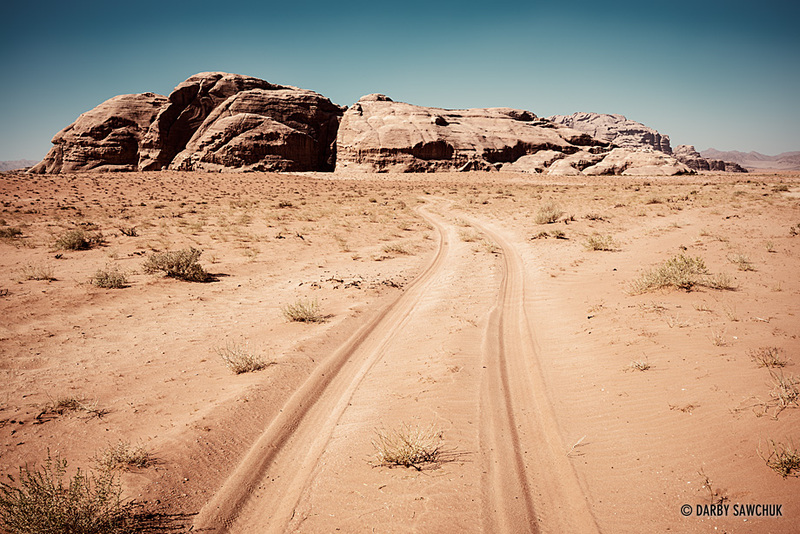 Jeep tracks lead through the sands of Wadi Rum towards one of its many rock sandstone hills. 62. 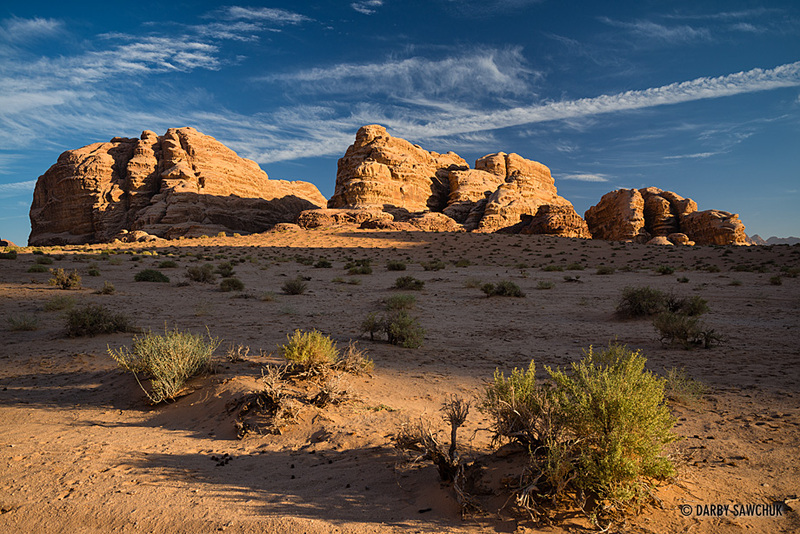 Sandstone rock formations in the desert of Wadi Rum, Jordan. 64. 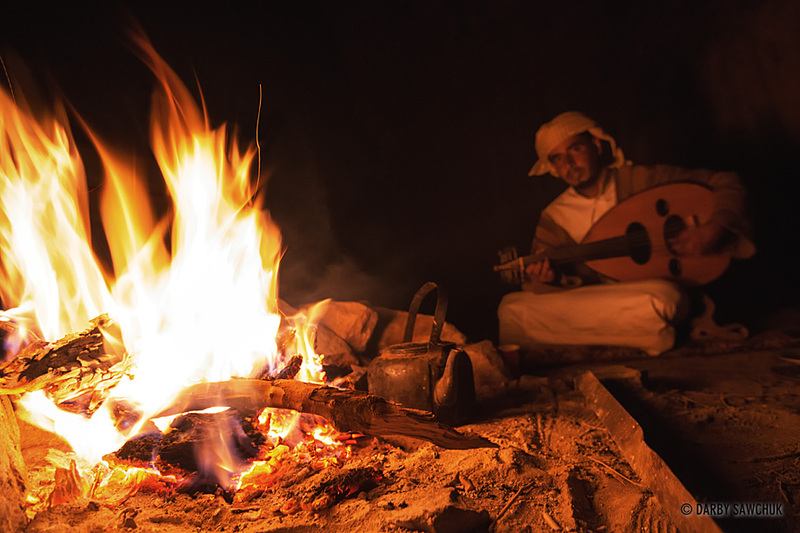 A bedouin musician plays an oud by firelight in Wadi Rum, Jordan. 65. 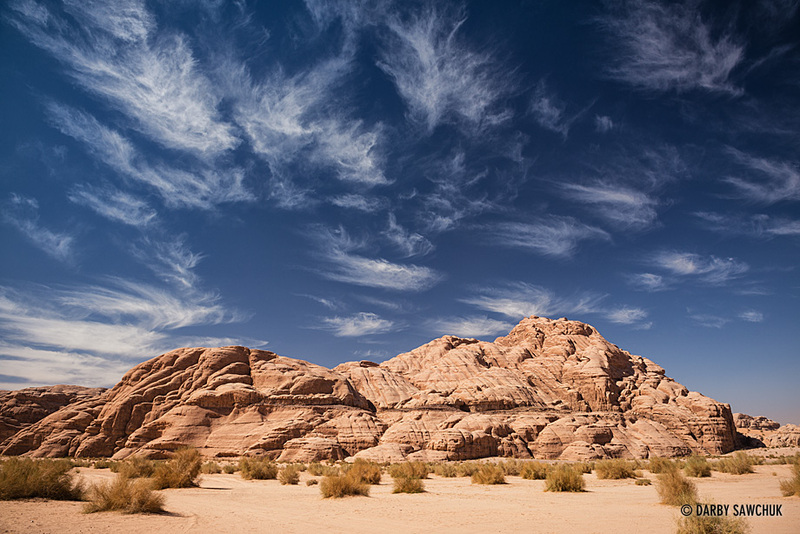 Clouds streak the sky over the rock formations of Wadi Rum, Jordan. 66. 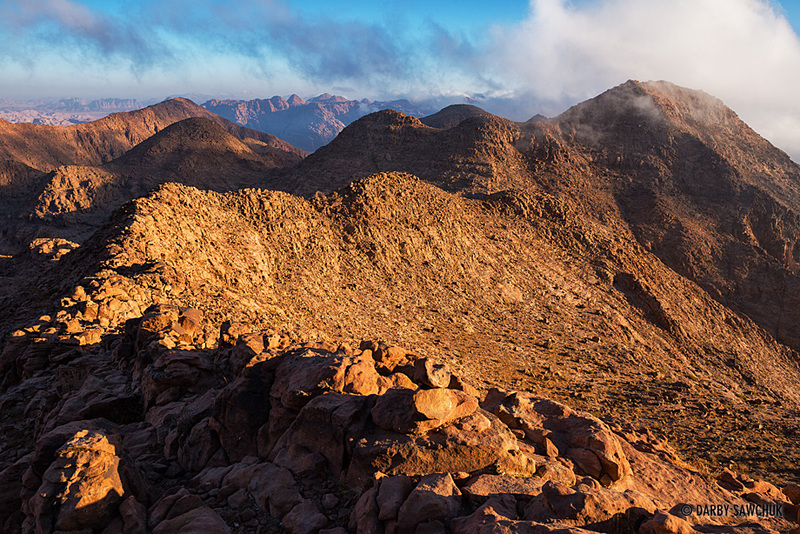 Clouds roll over the southern mountains of Jordan in a view from Jabal Umm ad Dami, Jordan’s tallest mountain. 67. 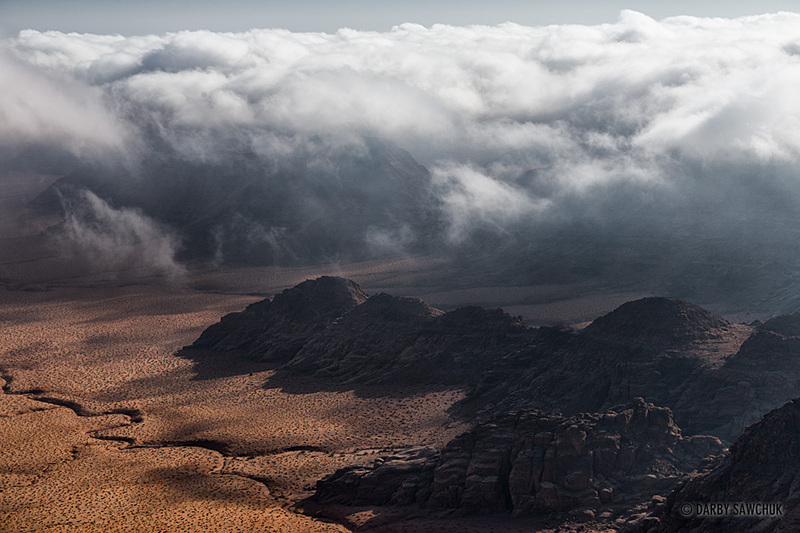 Clouds roll over the southern mountains of Jordan in a view from Jabal Umm ad Dami, Jordan’s tallest mountain. 68. 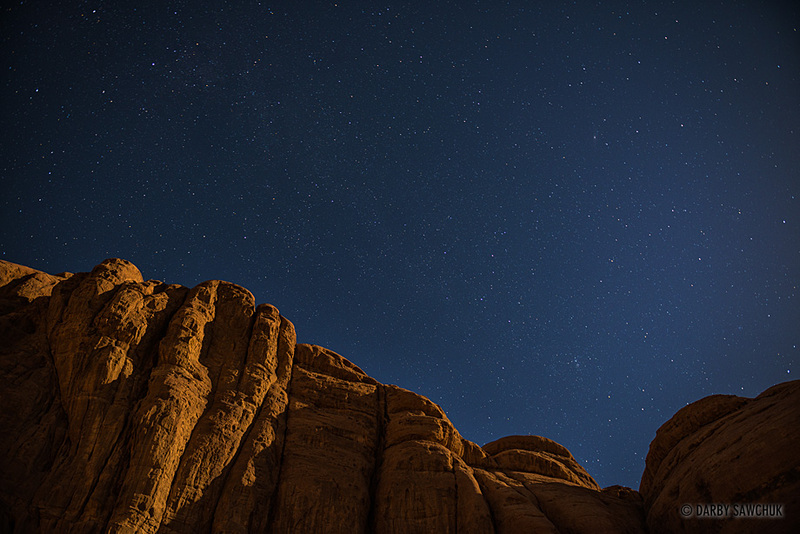 Stars shine above the moonlit rocks of one of Wadi Rum’s jebels. 69. 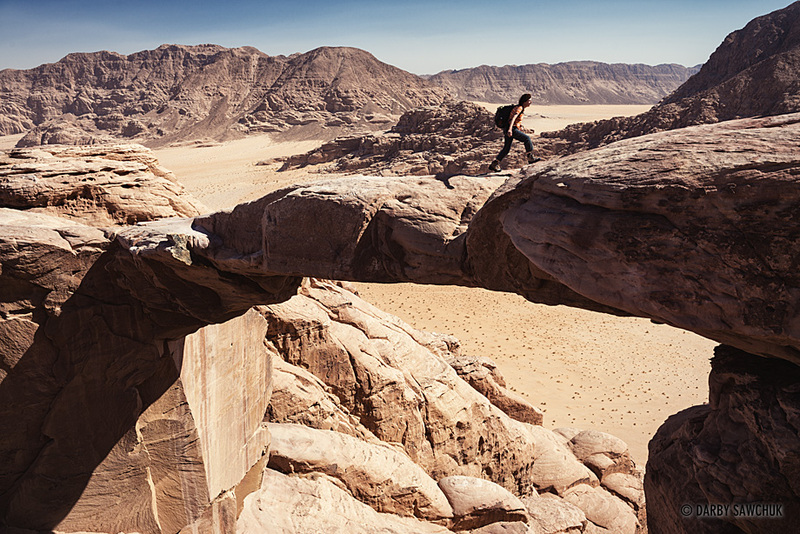 A hiker walks across the narrow rock bridge of Burdah Arch high above Jebel Burdah and the desert of Wadi Rum. 71. 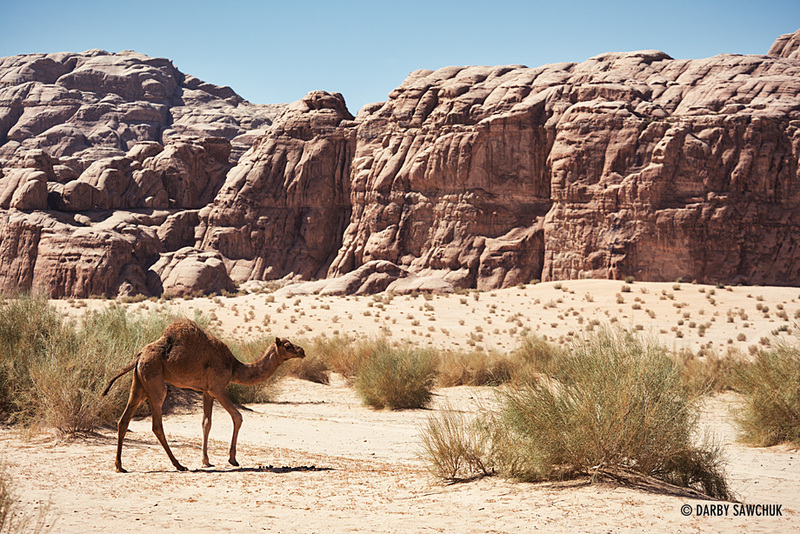 A young camel walks along the sands of Wadi Rum. 72. 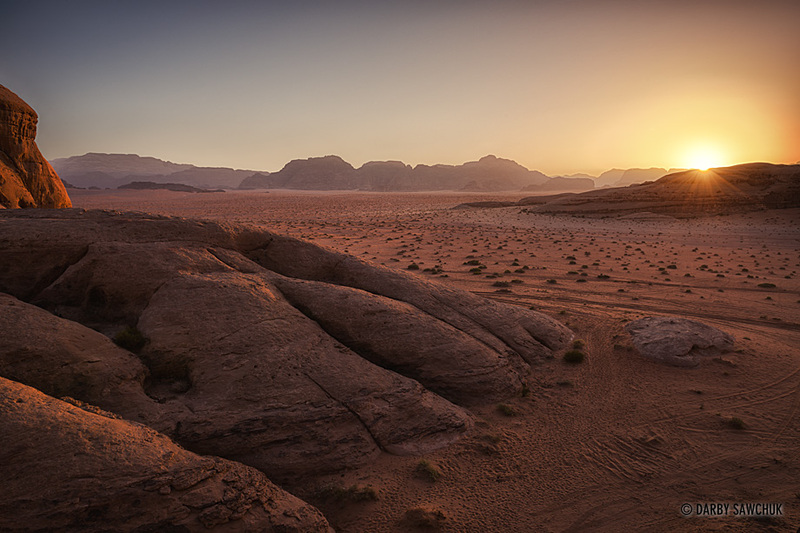 Sunrise over the desert sands and jebels of Wadi Rum, Jordan. 73. Sandstone rock formations in the desert of Wadi Rum, Jordan. 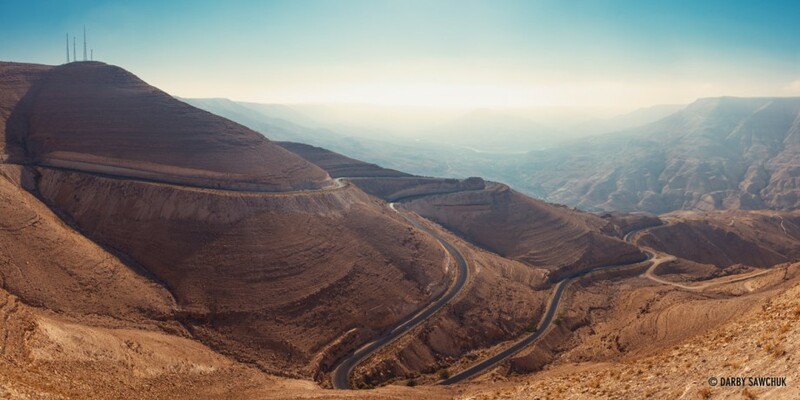 Keywords: photos of jordan, images of jordan, pictures of jordan, jordan, landscape photography, travel photography, architectural photography, fine art prints, stock photography, petra, amman, wadi rum, madaba, jerash.